April 1, 2019 (Last Updated: March 21, 2019) - As an Amazon Associate I earn from qualifying purchases. 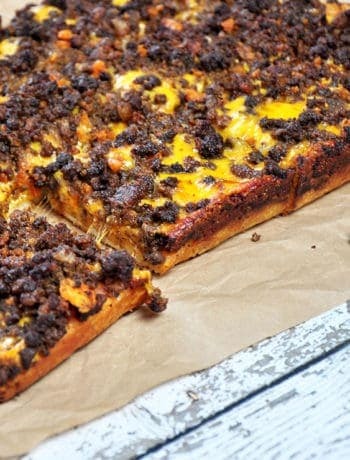 I have been eating SO MUCH pizza lately and I almost didn’t include this Detroit Style Greek Pizza in our Detroit Pizza series, but I am glad I did. 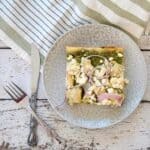 This Detroit Style Inspired Greek Pizza is super tasty and has an awesome green olive and walnut pesto that gives it a big flavor. 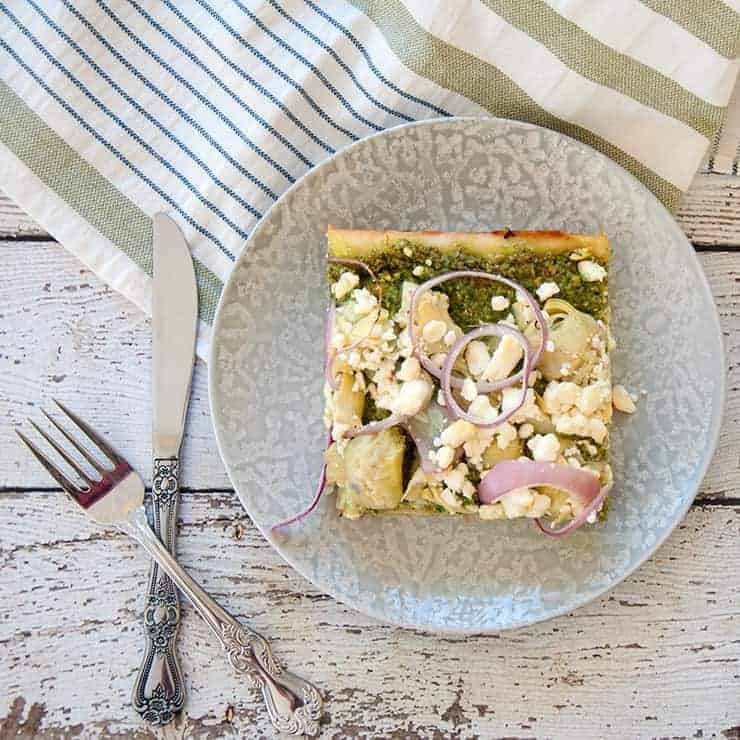 This recipe brings delicious Greek flavors to a Detroit style pizza and you will want to make it. These flavors work so well together, even though it is not a traditional Greek or Detroit style pizza. 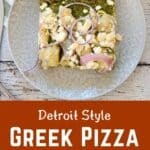 Of course, we are working with a traditional Detroit crust that has been baked in a Detroit style pan, but we are also bringing traditional Greek flavors to the table. 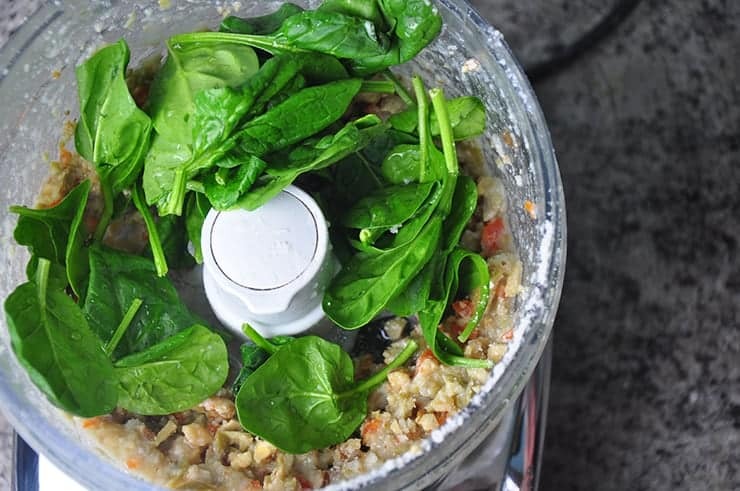 I decided not to go with a traditional pesto, but instead used an olive, walnut, and spinach combination for ours. Walnuts really didn’t strike me as a Greek ingredient, but apparently, the nut has a long history in the region and Ancient Greeks were the first to selectively breed the nut. This pesto really tastes good and was happy I have been able to put my Costco olives to good use outside of the martinis I enjoy. Also, olives are not a normal pesto ingredient, but it really was fun to use and it does add a great taste. The rest of the toppings really just felt right for a Greek pizza and the feeling extended to my dinner table. 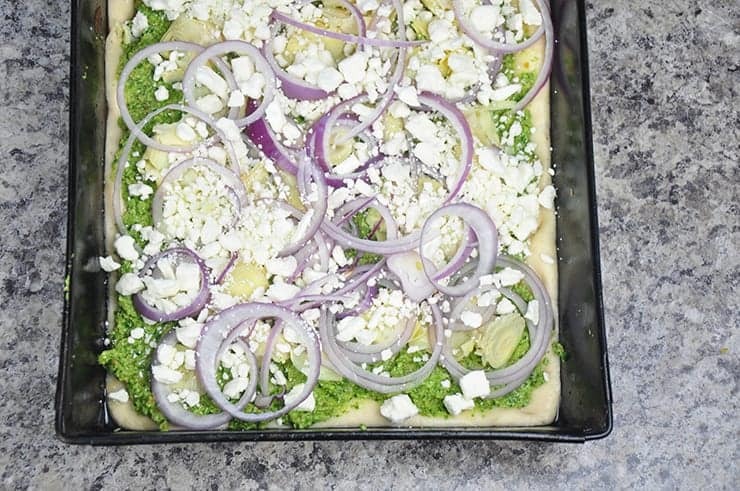 The smell, color, and taste really come together and work with the pesto to give a great pop of Greek flavors! In all of our other Detroit Style Pizzas, we cook our pizza on super high heat. We wanted to get the right amount of melt and combine it with the edges to give that traditional Detroit style feel. We are breaking the rules here a bit, as feta cheese just doesn’t melt the same as mozzarella or really most other cheeses. So, we turn the heat down to 500 Fahrenheit for this bake and end up giving it a little bit more time in the oven. This allows the bottom of this big Greek pizza to get a bit more crispness and not burn the top. Like with all of our other Detroit Style Pizza, I used the traditional pan. I am not sure it was quite as necessary in this recipe as the others, but it still worked great. I was really happy with how this Greek Pizza turned out. Not only does it taste awesome, it makes my kitchen smell fantastic. 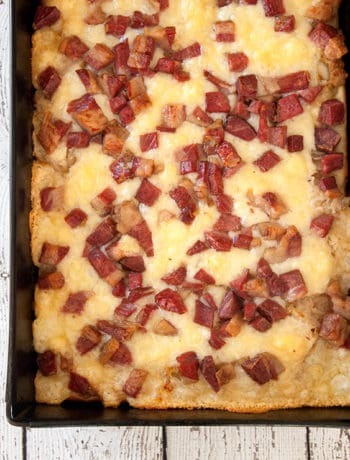 It has a lot of big, flavorful ingredients that make it something special and a great recipe to store away in your recipe book! I hope you enjoy it and let me know how it goes. 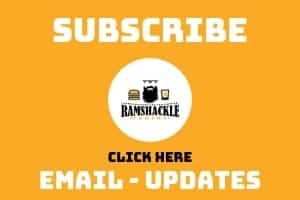 If you do like it, please share on Pinterest or Facebook and consider signing up to get updates sent to your inbox. This is a Detroit Style inspired Greek Pizza that has the comfort of a deep dish and all the big flavors of a Greek Pizza. 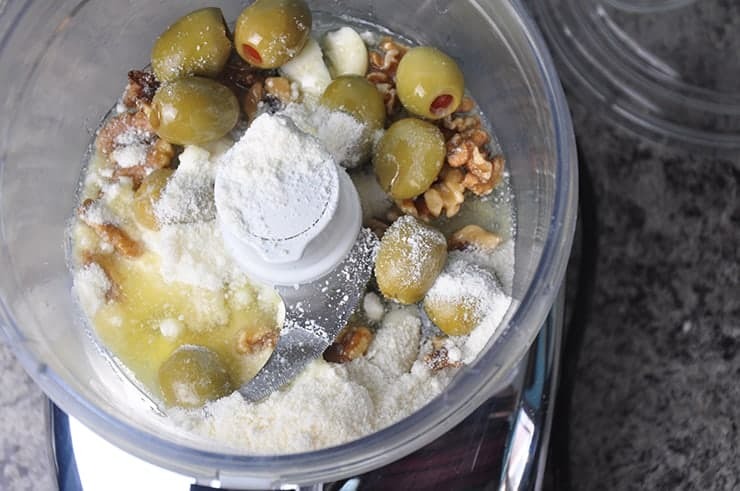 The Walnut Olive pesto is tasty and adds something really special to this pizza recipe. Allow sauce to simmer for 30 minutes and set aside. Once 30 minutes has passed, remove pizza and preheat to 500 Farenheight, making sure one rack is on bottom space. Once preheated, add pizza to bottom rack for 15-17 minutes. Watch to make sure it doesn’t burn, but you do want a nice golden brown crust with darker edges. Use pizza cutter to cut into 6 pieces. 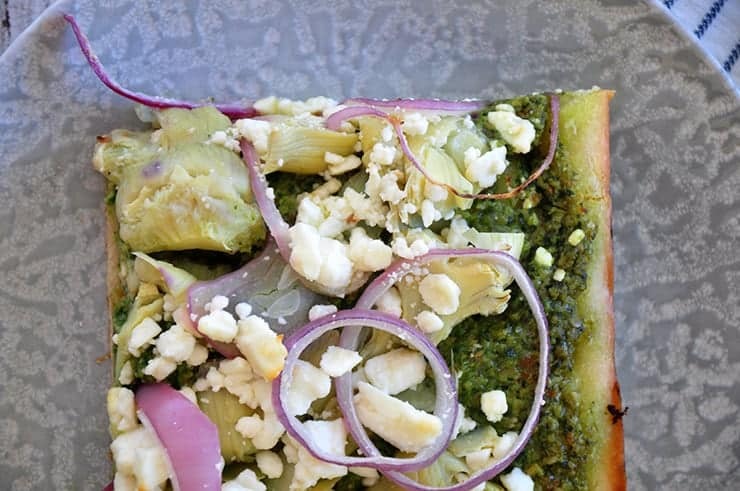 I love greek toppings on pizza, especially artichoke and feta! 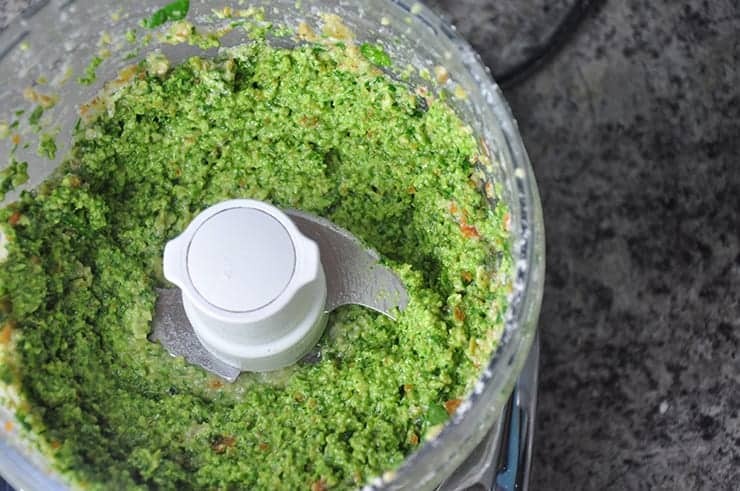 I’ve always enjoyed it with tomato based sauces, but really like the idea of pesto as the base. I’ll have to give this one a try!